Assistant horn professor Michelle Reed Baker (MM ’87) joined the Metropolitan Opera Orchestra as a sub in 1990, winning a permanent second chair in 1991. 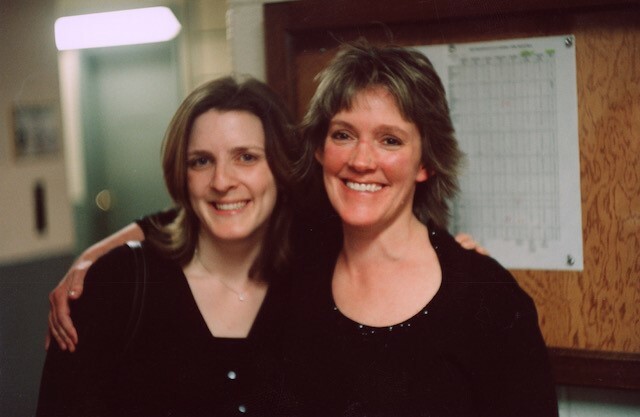 On the eve of her retirement from the orchestra this spring, Met fourth chair Barbara Jöstlein Currie (BM ’98) interviewed her for an article first published in The Horn Call international magazine and reprinted on the Met orchestra's website, MetOrchestramusicians.org. What follows is an edited excerpt, which appears by permission. Alumna and assistant horn professor Michelle Reed Baker (right), who retired from the Metropolitan Opera Orchestra this spring, spoke with alumna and fellow Met Orchestra horn player Barbara Jöstlein Currie (left). It’s a little-known fact that the best seat at the Metropolitan Opera house isn’t in the front row, or in the glamorous boxes. Rather, it’s the fourth horn chair, a position I have played for the past 18 years. From this seat, I hear the warm, rich sounds emanating from Michelle Baker’s bell, mingled with the beautiful phrasing and tones of the principal and third horns to my left. To hear Michelle—who started at the Met in the fall of 1990—play the opening solo from Das Rheingold so effortlessly and with that warm sound, full of so many colors, is something I wish every horn player could experience. Having grown up in Pearland, Tex., Michelle started piano lessons at age 6 and playing the horn at 12. She got her bachelor’s at the University of Houston, where she studied with, among others, Julie Landsman (BM ’75; faculty 1989-present), the Met’s principal hornist from 1983 to 2010; at Juilliard she studied with James Chambers (faculty 1946-89). Afterward she played with the New Jersey Symphony Orchestra (where her husband, Charlie Baker, is principal trombone) for three years before joining the Met. In addition to Juilliard, she teaches at the Manhattan School, Montclair State, and the Round Top Music Festival in Texas. What were some of your influences in learning to be such an effective second horn player? Julie Landsman and I fit together easily because she made me feel so comfortable. She taught me to listen left and to fit inside her sound. I learned along the way how to lose my ego so we were a unit. Since the first time I heard Julie play, I knew I wanted to sound like her—that warm, gorgeous sound! Plus she plays with so much of her heart. Getting to sit next to her for 20 years was a privilege and a thrill. I agree, the two of you sounded like one horn! Do you have any other influences in regard to second horn playing? James Levine (Diploma ’63, orchestral conducting) comes to mind. He encouraged me to play much softer than I ever imagined possible, as well as to play shorter notes in general. To play any Mozart with him was the best. I grew up with five older brothers so it had no effect on me at all! How do you deal with stressful performing situations so well? Are there any singers who particularly inspire you? Dmitri Hvorostovsky for his singing as well as the fact that he breathes very loudly, which gave me the O.K. to breathe loudly and take in as much air as possible. Debbie Voigt phrases beautifully. René Pape’s tone quality and smoothness is amazing, especially in his recent Met Parsifal. Also, I love Peter Mattei and the way he adds a little shimmer on important notes that makes his phrasing interesting and beautiful. If I have a lot of time, my warmup will take around 35-40 minutes. If I don’t have that much time, or if I’m still warmed up from a late night the night before, I’ll spend less. If it’s a short warmup, I will free buzz while blow-drying my hair and buzz on my mouthpiece in the car on the way to rehearsal! For my optimal warmup, I will play on the F horn side, which has two advantages: developing your tone as well as the fact that it acts like a batting doughnut, so that when you use the B-flat side, it will offer less resistance, making the notes easier to play. What are your post-retirement plans? I will continue teaching a lot and hopefully freelance a bit. I will also play in the Montclair Orchestra, which is led by the Met’s concertmaster, David Chan (MM ’97, violin). And I will spend a lot of time with my family and grandchildren. I would also like to continue doing work through my church for social issues, such as homelessness and poverty, as well as teaching Sunday school and playing piano! Barbara Jöstlein Currie (BM ’98, horn) is taking a year off from the Metropolitan Opera Orchestra to play second horn with the San Diego Symphony Orchestra.